On this edition of Getting REAL Bridget tells Trulia their information is wrong, gives us six reasons why home prices are going up, then closes by sharing useful disaster preparedness information. One of the most confusing aspects of buying or selling your home is the titles/escrow process. 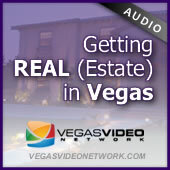 In this episode of Getting REAL (Estate) in Vegas, Channelle Beller (Equity Title of Nevada) helps us better understand the ins and outs of the last step of your real estate transaction. With market inventory going down, and prices going up Bridget gives us a sneak peak into a new online feature to help buyers. For those of us looking to short sell a home we have insightful tips in creating a short sale package. It looks like the banks have finally been told to account for their often illegal ways as Bridget walks us through the particulars of the recently announced $26 billion Foreclosure Fraud Settlement. There are some people on the Vegas Video Network that insist that living in Las Vegas without a pool is no way to live. Bridget, on the other hand, provides a more balanced look at adding 20,000 gallons of water to your back yard. She follows that with IRS deductions for which all home owners should be aware.